With its acquisition of gesture-recognition company Flutter, Google may be looking to beef up Google Glass and its Android products while also looking to win over the hearts and minds of Apple iPhone users. Flutter, a San Francisco-based startup, announced the acquisition on its website on Wednesday. 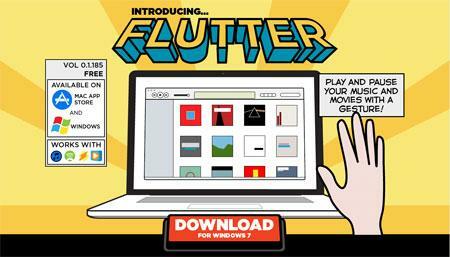 The Flutter app uses gesture recognition technology over a built-in webcam in a user's computer, enabling the user to control programs like iTunes, Spotify and QuickTime using hand gestures. It also allows users to control music and videos in Google Chrome with gestures. Google and Flutter already have signed the deal. The purchase price and other terms were not disclosed. "Today, we are thrilled to announce that we will be continuing our research at Google," wrote Flutter CEO Navneet Dalal. "We share Google's passion for 10x thinking, and we're excited to add their rocket fuel to our journey." A Google spokeswoman said the company will collaborate with Flutter's team of developers and engineers but would not say how Google plans to use the technology in its products. However, there are some fairly clear products that could benefit from new gesture control technology. Google is a company that would like to have its finger on a wide range of aspects of the user experience -- hardware, software and user services. That also includes control interfaces, such as touch, speech and gesture. "Flutter fills in the IP and experience gap Google has with machine vision to control devices with air gestures," said Patrick Moorhead, an analyst with Moor Insights & Strategy. "The best natural user interfaces will be multi-modal, meaning the device will use the best input method for the situation, melding direct touch, indirect touch-like gestures, and spoken word into one UI." Google Glass, for instance, is controlled by voice, touch and gesture control. Improving its gesture control feature would only help users once the computerized eyewear is officially released. About 8,000 early testers having been using Glass for several months but the device is expected to ship in 2014. Flutter's technology also could be used to add gesture recognition control to Android devices, which are in a hot competition with Apple's iPhone and iPad. If Google could make the Android platform the clear leader in gesture control, it would have a solid leg up on rival Apple. "This might help them win over the hearts and minds of some Apple users," said Dan Olds, an analyst with The Gabriel Consulting Group. "Giving developers more ability to program to the gesture API could also drive development of more tablet applications oriented toward business. We could see applications specifically geared to speed up workflow in particularly keyboard-intensive jobs.Cons"
For example, consider how many keystrokes it takes for an airline reservation agent to book or change a flight, Olds said. With better gesture recognition technology, there would be less typing and possibly faster work to get a passenger a window seat on his next trip. Gesture recognition looms as a key technology in the future for simplifying and speeding common tasks. The technology is expected to evolve from novel uses today to more useful tasks, even in the enterpise, in the next five years or so. "It's not the best input method for everything, but best when used from a distance from what the user is trying to control, when manipulating a complex object, with large display surfaces, or where speech control or direct touch isn't appropriate," Moore said. Google also could use Flutter's gesture control technology in products like Google TV, Chromebooks and even automobiles. This article, Google may use Flutter's gesture control to boost Glass, Android , was originally published at Computerworld.com.